I keep reading all these hints and teasers about a new DCC RPG. Does that mean their wont be any Paragon adventures for Punjar? That got mentioned on these boards as in the works a while ago. But with the slow schedule for 4e DCCs I guess thats not happening??? I'd hate it if you blew off 4e to work on an old-school game. We'd support anything you did for 3.5, or Pathfinder, or 4e. But the old-school rules just isnt my group's thing, we already tried Labyrinth Lord and didnt like it. Are you guys ever going to support 4e D&D with adventures the way you did with 3.5 or are you just skipping on ahead to you new old-school game? My group wants to support your 4e adventures, we're still waiting for the Paragon Punjar adventures and the module that was supposed to follow the Forgotten Portal! (FOrgotten Portal was great BTW!) I have to say I really dont understand why you've stopped making them, or don't make nearly as much as you used to. We need more adventures for 4e! Glad to hear your group "loved" Forgotten Portal. Share some details when you get a chance. I'd enjoy reading how your group dealt with the challenges, especially the Nine Tests. It was not easy designing challenges in 4E that were not just combats. But the old-school rules just isnt my group's thing, we already tried Labyrinth Lord and didnt like it. Nobody ever said DCC RPG used old-school rules. At least, nobody from Goodman Games. We need more adventures for 4e! Why is “getting there” only half the fun? 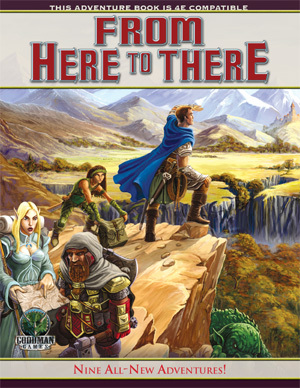 From Here to There presents nine all-new adventures focused on traveling from point A to point B. Sure, your players may be going from one dungeon to another – but why not spice up things in between? From aerial assaults to haunted bridges, From Here to There turns “getting there” into a lot more fun! Covering levels 2 to 13, this compilation has a place in every campaign. Nice cover -- this looks good!